We had over 70 participants keen to see what James had to offer and also learn from his experience and expertise. At the age of 13 James went to London to audition for the new musical Billy Elliot. After successfully beating 3,000 other candidates, James became one of the three original Billy Elliots to play the part in the West End’s Victoria Palace Theatre. He was involved in the development of the role of Billy from the very beginning, and contributed to the success of the show with critically acclaimed performances in acting, singing and dancing. The show opened on 31 March 2005. In that year, he won the Variety Club’s Outstanding New Talent Award and also the Theatre Goers’ Choice of Most Promising New Comer. He also jointly won the prestigious Sir Laurence Olivier Award in 2006 for Best Actor in a Musical. The children were taken through a journey of song, dance and drama and performed a fantastic version of “Electricity” at the end of the workshop. 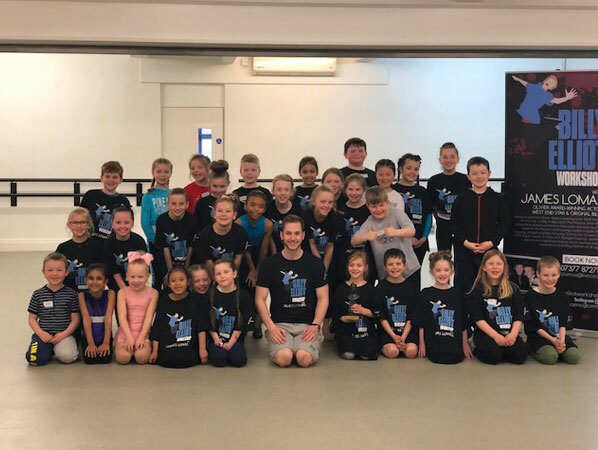 CC Dance Company pupil Imogen Everard 10 years old said; “It has been amazing, I just kept smiling because I was enjoying myself so much. I want him to come back every week”. To find out more about the school call today on 01274 585317, and book in a free tour.